Figure 1 from Wilson, Gosling and Graham (2012). People like using Facebook, and researchers apparently *really* like people who like using Facebook. 1. Who is using Facebook? 2. Why do people use Facebook? 3. How are people presenting themselves on Facebook? 4. How is Facebook affecting relationships among groups and individuals? 5. 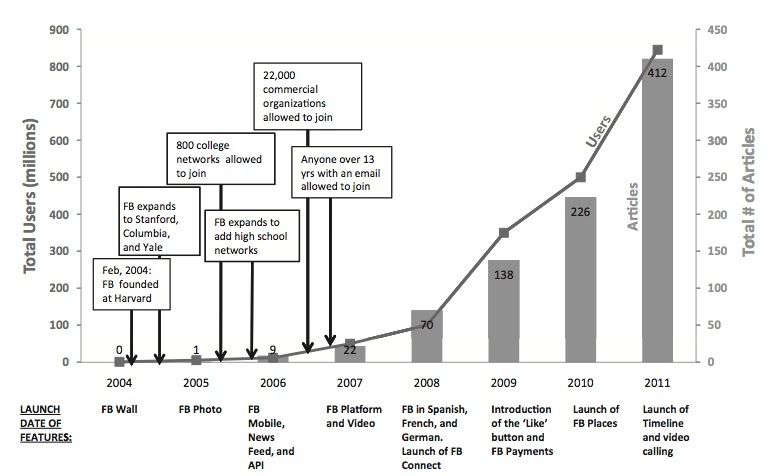 Why are people disclosing information on Facebook despite potential risks? The authors suggest that, as well as just being a descriptive characterisation of the literature, these five central questions might serve as a common framework for future research in other online social networks, especially research which seeks to compare patterns of usage across two or more networks. Seems reasonable. Also of interest (to me, anyway) is Appendix B which details the major data collection methods used by the studies, and also discusses some ethical considerations. It notes that some researchers have built custom applications for Facebook in order to collect data, but that these applications are not always successful in attracting a large user-base, i.e. some ‘go viral’ and some do not. This seems like an opportunity to do some interesting ‘meta’-research; a study of which research-driven applications are successful, and which aren’t! Online social networks are an important part of many people’s social lives nowadays, and it seems unlikely that their influence has even come close to peaking yet; we can only expect that take-up and usage of these social tools will carry on increasing (and perhaps even accelerating) for some time. It’s good to see that social scientists have embraced these new ways that we all interact and are making serious efforts to describe and evaluate them. A very minimal post just to point you towards something else I’ve written that you might find of interest. 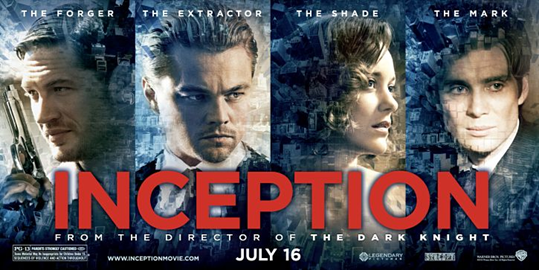 It’s putatively a review of the film ‘Inception’ but I end up talking about some other movies too, and especially about some recent developments in neuroscience that are related to the ideas in the films. You can read it here at Scientific Kitty. There’s lots of other great reviews by scientists on SK as well (including my earlier review of ‘Limitless’) so make sure you have a good poke around while you’re there.